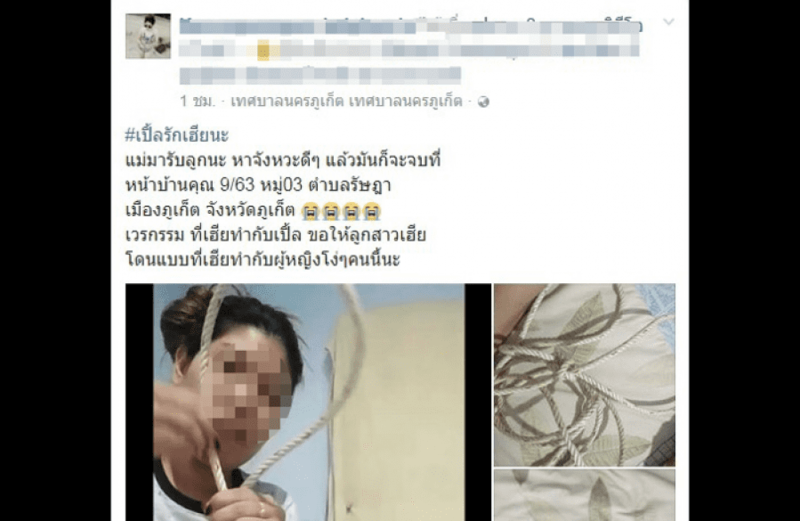 PHUKET: A Phuket woman is reportedly safe after widespread alarm was raised over a video clip she shared on Facebook last week announcing her intention to end her life. The woman, whose name her family has asked to withhold, said she was hurt by her boyfriend and no longer wished to continue living. “I love you, and when the time is right, I will end it all at your door. I hope your daughter is hurt the way you hurt me,” she said in the video. Photos attached to the post also showed a noose. Several people commented on the post to try to dissuade her and others shared it in hopes of locating her family members and warning them before she made good on her threat. The woman was later reported to be safe and received help before she caused herself serious harm. The Facebook post has since been deleted. Her actions drew widespread attention, especially since a 21-year-old man live streamed himself hanging his 11-month-old daughter before ending his own life at an abandoned Phuket construction site in April (story here).